The eBook was designed to harness the power of storytelling to improve environmental health literacy for health professionals, policy makers and health advocates. It was developed by a team from the Collaborative on Health and the Environment (CHE), ATSDR, the Office of Environmental Health Hazard Assessment, California EPA (OEHHA), the Science and Environmental Health Network (SEHN), and the Western States Pediatric Environmental Health Specialty Unit (PEHSU). The first installment of the eBook, with chapters on asthma, developmental disabilities and childhood leukemia, is available for free download on the CHE website. Health professionals can register for free continuing education credits (CE) through the CDC. A fourth story on infertility and reproductive health is in development. This entry was posted in breaking news and tagged A Story of Health, asthma, award, childhood leukemia, developmental disabilities. Bookmark the permalink. 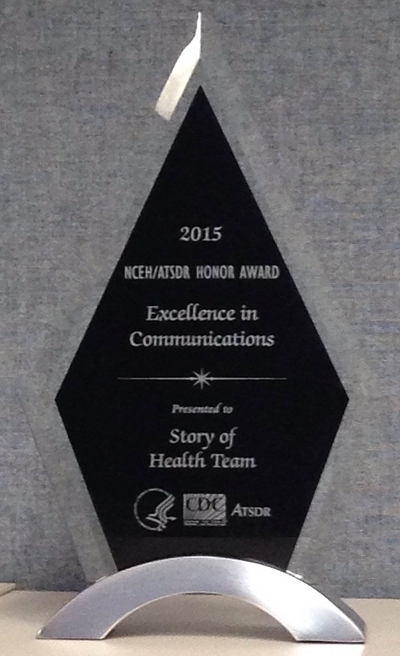 Congratulations to all involved in developing “The Story of Health” on winning this important recognition from the CDC. Special congratulations to Maria Valenti for all she did to bring the “Story” to life.